Taking online surveys is a popular and convenient way of earning some extra cash for household expenses or luxury items. However, the income earned through these endeavors is usually considered self-employment in the UK and is subject to taxation, which may present problems for individuals who have not planned ahead to meet this additional expense. In order to properly prepare for any tax liability, HM Revenue & Customs (HMRC) has outlined the correct steps for self-employed survey takers to follow in order to remain in compliance with U.K. tax law. Is the activity conducted at the individual’s own financial risk? Can the individual set his or her own hours and pace of work? Does the individual perform work for a number of different employers? Does the individual provide the equipment and tools necessary to perform the work? Could the individual potentially hire someone else to perform a portion of the work on his or her behalf? Is the individuals paid by the job, rather than receiving an hourly rate? If the answers to most of these questions are yes, then it is necessary to register as a self-employed person with HMRC. This does not mean that tax will be due on the earnings; it simply ensures that all earnings are properly reported to HMRC as legally required. Registration is a simple process and can be completed online; in most cases, only one or two forms are required in order to be in compliance with HMRC regulations. During the month of April each year, individuals who have registered as self-employed with HMRC will usually receive a letter reminding them to file online or, in some cases, a paper tax return to fill out and return by mail. While online filing is generally preferred due to increased accuracy and security, the traditional paper returns are also accepted by HMRC. Even those who will not owe any tax must fill out the tax returns in order to ensure that they comply with HMRC rules; paper tax returns must be completed and returned by 31 October, while online filers enjoy a longer filing period and can submit their returns anytime by 31 January of the following year. In most cases, no tax will be due if overall earnings do not exceed a certain amount, referred to as the personal allowance. The amount of the personal allowance varies depending on the age and total income of the individual. For the 2017-2018 tax year, individuals under the age of 65 and making under £100,000 can take a personal allowance of £11,500. 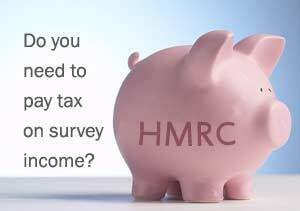 While income derived from taking surveys must still be reported to HMRC, typically no tax liability will be incurred for earnings under this amount. For those who both work for a traditional employer and also gain income from self-employment as survey takers, the process of determining tax liability can be more complex. However, assuming that the total income earned by the individual from both traditional employment and self-employment taking surveys does not exceed £100,000, only the amount over the personal allowance is subject to tax by HMRC. No single article can provide comprehensive legal or tax advice regarding self-employment rules; however, the HMRC website is a useful source of information for individuals who earn income from taking surveys regardless of whether they are otherwise employed. By maintaining full compliance with HMRC regulations, survey takers can ensure that they keep more of their hard-earned money to live on and enjoy.